An american classic meal that can be made better by the right wine pairing. In deciding what to pair - it's really all about the toppings. So right after singing a chorus or two of "Who Let the Dogs Out...Who...Who?" check out my pairing advice. A simple hot dog with mustard, and maybe a touch of sauerkraut to add a nice acidic bite. The delicious, topping packed Chicago dog with mustard, neon green relish tomato slices, pepper, pickle spear, and celery salt. The chili dog - topped with a great chili (no beans please! ), cheese and onions. A simple hot dog can be paired nicely with a simple white wine, but I believe the way to go is a dry but fruity Rosé - just make sure it is a lighter colored wine which will tend to be lower in bitterness. For the Chicago hot dog, a lighter white wine is best. A fruity Riesling from Washington State or Australia is a nice pairing. Sauvignon Blanc is another good choice with a good amount of acid, plus the grassy notes of the wine pair nicely with the various toppings. A chili dog and a beer is always a good pairing, but a good hearty chili is also a nice partner with a fruity Red Zinfandel or Pinot Noir. The Chicago dog's peppers, and spice from the chili on our Chili dog will not play nicely with big tannic red wines. The spice will accentuate the alcohol and throw the wine off balance. This also goes for big oaky Chardonnays as well. 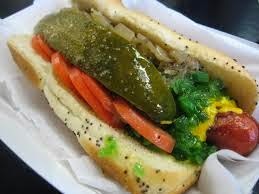 For the simple hot dog and the Chicago Dog, the acidity of the toppings needs a wine with a good amount of acidity. Avoid a Gewürtztraminer that may be too low in acid to hang.